The following was sent to us from Jane Niehause, President of the Corkscrew Picklers Pickleball Club. The pictures are from their recent Activities Fair. Every year Corkscrew Woodlands in Estero, Florida has an Activities Fair early in January to showcase all the sports, dancing, card, book, and garden clubs and dozens of other activities in our very active park. Pickleball, by far, was the MOST attended booth - a constant flurry of activity, with new players signing up anxious to learn the game. 14 signed up that day, and dozens have joined since. Thanks again for the support and encouragement provided by USAPA! This letter was sent from Jane to Dan Ellsworth, who works on the Grant Program for USAPA. On behalf of The Corkscrew Picklers, THANK YOU to USAPA for the generous grant of $250.00. We have formed a club and play 4 days a week in Corkscrew Woodlands in Estero, Florida. 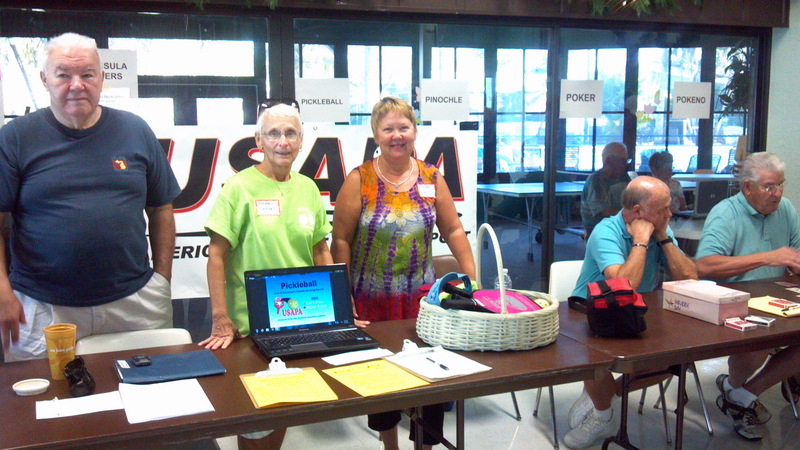 We are a 55 and over park, and have players spanning three decades. We share the courts with tennis players, so we have to dismantle nets each time we play and "tape" the courts on Thursday. We remove the tape each Sunday. 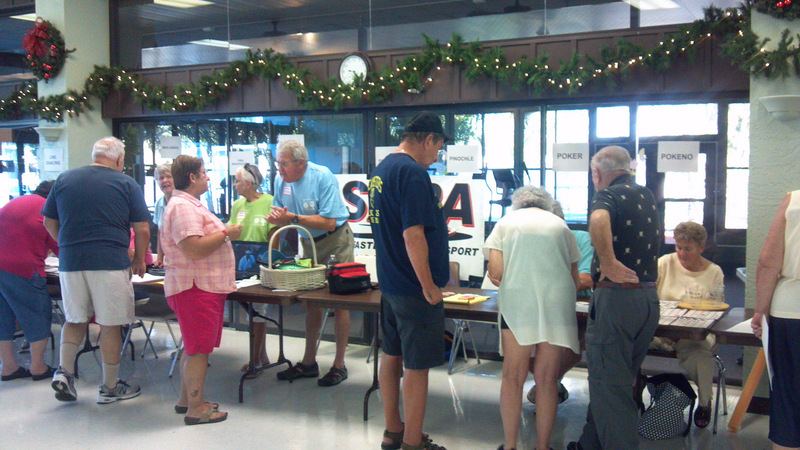 We proudly displayed our USAPA banner at a recent Activities Fair, and streamed your instructional CD during the event. 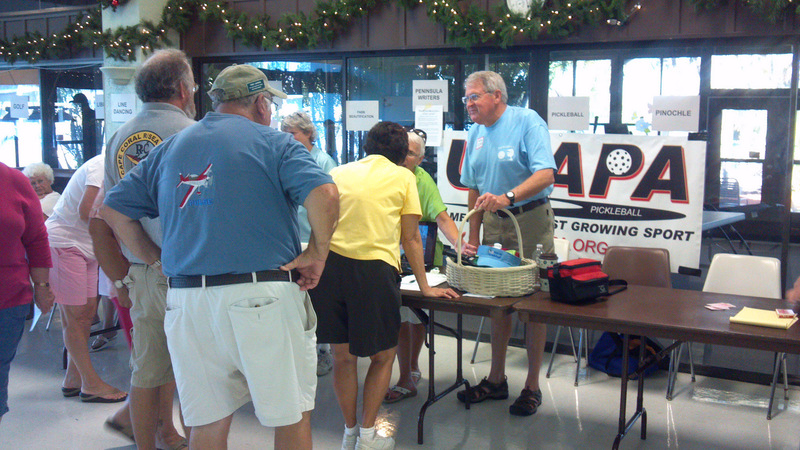 We distributed the literature provided by USAPA and used your rule book as our guide. We also post the banner at the courts during play. We have designated Friday afternoon as "Beginner's Play" and the more experienced players patiently introduce "newbies" and work with novice players. We use the "How To Host Beginner Demo Clinics: Sample Beginner Clinic Instructors Checklist" and are very happy with the results. We are initiating name tags this week, as we now have close to 50 players! Enclosed please find highlighted receipts for equipment purchased for Pickleball start-up in our park. I am looking for clubs in the area to play pickleball. I live in Grandezza in Estero. We have reciprocals starting next week. Any information appreciated! I would like to contact someone at Corkscrew Woodlands if possible.